CIVICUS is pleased to announce the publication of the Civil Society Index Analytical Country Report from our partner in Chile. The project was implemented in Chile by Fundacion Soles, with sponsorship from the Bicentennial Commission. 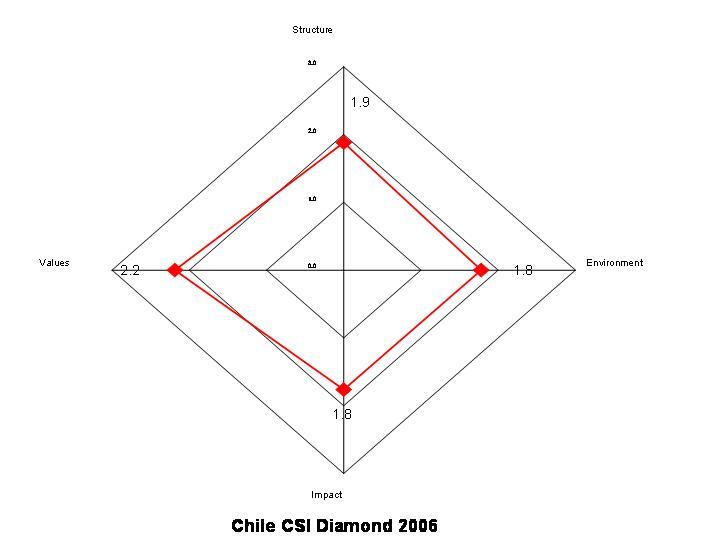 In general terms, the CSI Diamond for Chile’s civil society showed moderate values for most of the ‘internal’ dimensions (Civic Engagement, Level of Organisation, Practice of Values and Perception of Impact), corresponding to a medium level of development. The score for the External Environment, on the other hand, suggests a more favorable arena for the advancement of Civil Society Organisations (CSOs). Chile reports that it seems now to have passed the stage of democratic transition, and has strengthened mechanisms for formal elections and internal auditing. In general terms, it is an organised state with levels of corruption under control. Despite the weaknesses that remain from the previous coup d‘état and a dictatorship, civil society has had relative success in the process of associative reconstruction. New organisations, many of them based on information and communication technologies, have opened new spaces of citizen participation. However, the internal inequality of Chile’s civil society is one of the greatest challenges to the consolidation of a sustainable civil society and, in turn, a more profound and deeper democracy. To the degree to which it is possible, Chile’s civil society is looking for a space in general society, and is trying to create alliance mechanisms with the state and the market, without ceasing to offer an authentic, autonomous and credible voice. In the regional and national workshops which formed part of the CSI project, participants discussed key strengths of Chilean civil society, which include diversity among CSOs, the high commitment of most civil society representatives, the creation of networks with the support of ICT and, especially, the local impact of CSOs. The main weaknesses identified by participants included civil society’s capacity to promote training, challenges associated with civic education for society at large, and limited capacity to implement competitive and sustainable projects or to improve external cohesion. Participants also formed a number of recommendations which are made in the report. For example, in order to improve external cohesion, one suggestion was to create a training space to help civil society leaders and representatives define themselves and the sector as a third party, deserving of conditions equal to those of the state and the private sphere. 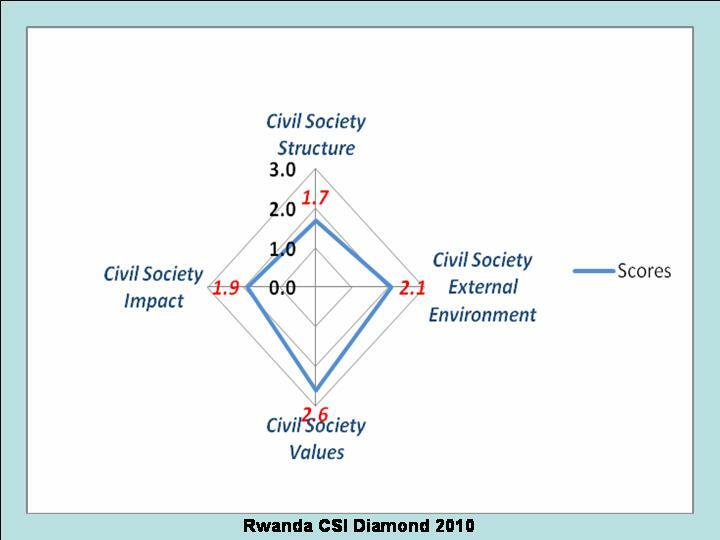 The CIVICUS Civil Society Index (CSI) is pleased to announce the publication of the CSI report from Rwanda. The project was implemented in Rwanda by the Conseil de Concertation des Organisations d’Appui aux Initiatives de Base (CCOAIB), with financial support from the United Nations Development Programme (UNDP). As far as civil society structure is concerned, the study looked at a number of indicators pointing to the breadth of citizen participation, charitable giving, volunteering, collective community action, civil society activities, civil society membership and civil society geographical distribution. Generally, weaknesses prevail within this area, with only charitable giving and collective community action appearing to be strong. Against this, on the whole, Rwandan civil society is felt to adhere strongly to positive values, such as anti-corruption, gender equity, poverty eradication, tolerance and democracy promotion. However, the study also reveals that Rwandan civil society has weak spots around encouraging governmental transparency and environmental protection. Some of the recommendations that the report makes include improving partnership between the state, private sector and civil society, strengthening CSO voices in lobbying and advocacy, find ways of minimising dependence on and influence by external donors by strengthening and diversifying domestic fundraising techniques, and concentrating on ways of boosting the capacity of civil society to hold the government accountable for its decisions. The CIVICUS Civil Society Index is pleased to announce the release of the Analytical Country Report on the state of civil society in Kazakhstan. The project was implemented in Kazakhstan with the cooperation of the Public Policy Research Centre and CIVICUS. 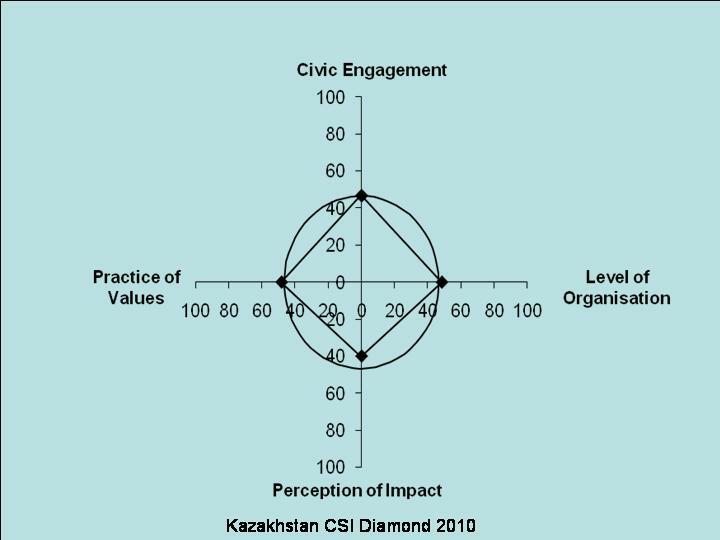 The Civil Society Index Diamond (see Figure 1 below), summarises the strength of four core dimensions of civil society in Kazakhstan (Civic Engagement, Level of Organisation, Practice of Values and Perception of Impact). 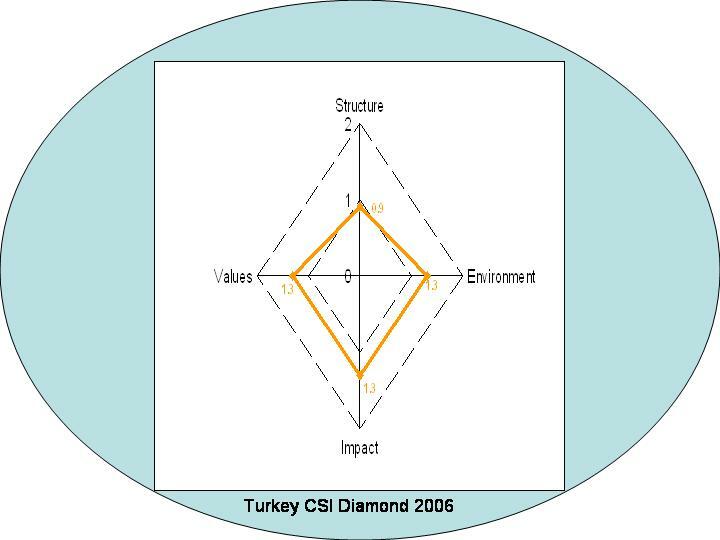 The circle around the diamond represents the fifth dimension, the External Environment within which civil society operates. 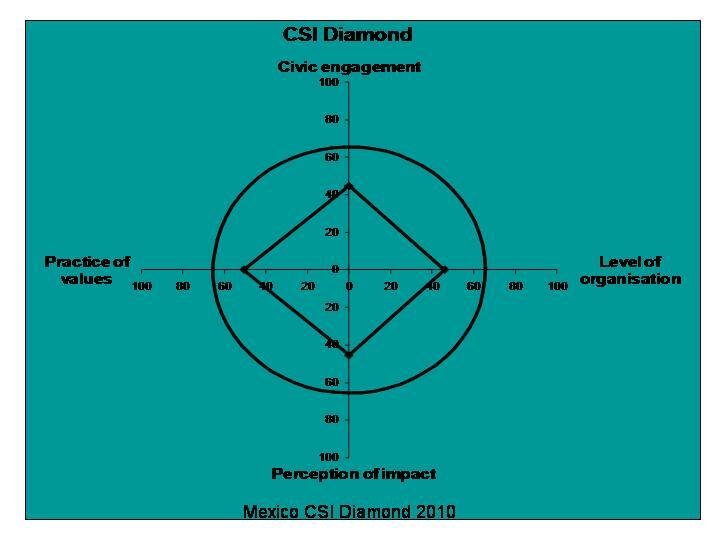 The diamond’s size shows an empirical picture of the state of civil society, the conditions that support or inhibit civil society’s development, as well as the consequences of civil society’s activities for society at large. The overall picture revealed by the Civil Society Index Diamond is one of a moderately developed Kazakhstan civil society. The report identifies key strengths and weaknesses of civil society in Kazakhstan. Principal strengths include the flexibility of CSOs, openness to networking and exchanging information, and some successes in promoting values such as religious harmony and better relations between ethnic groups. CSOs in Kazakhstan tend to be well organised and motivated, and familiar with social needs, and they are often well grounded in the local environment and concerns. A general wish exists among CSOs to participate in civil dialogue, and the fact that CSOs demonstrate some expertise to advance policies continues to be a real asset on which Kazakhstan civil society can build. Some of the weaknesses identified by the research include the absence of a participatory democracy and low standard of living in Kazakhstan which prevents people from engaging more with civil society activities, something that can be seen in the low levels of volunteering. CSOs in Kazakhstan also lack sustainable human resources and have short-term financial plans which demands some trade off between values and operations. There is limited transparency around the use of public funds, and unfair competition in public funding, which risks the credibility of the sector, while a limited culture of philanthropy means it is hard to find other funding sources. Cooperation between the government, civil society and the private sector also remains weak all round, with state authorities interfering with CSOs and treating them unequally. Recommendations to improve the state of civil society: amendments to existing government legislation to establish criteria for the work of CSOs in the public interest, open competition for state funding, and more work by CSOs to educate citizens about civil dialogue and encourage greater activism. Some of the weaknesses identified by the research include the absence of a participatory democracy and low standard of living which prevents people from engaging more with civil society activities. CSOs in Kazakhstan also lack sustainable human resources and have short-term financial plans which demands that some values be sacrifices. Cooperation between the government, civil society and the private sector also remains weak, with state authorities interfering with and threatening CSOs. Recommendations to improve the state of civil society were discussed with a wide range of stakeholders at the CSI National Workshop and regional focus group meetings. Some of then were: amendments to existing government legislation to establish criteria for work of CSOs in public interest, make funding for state social contracts open and transparent, attempt to create employment opportunities through more stable funding and for CSOs to increase efforts to educate citizens about civil dialogue, and activism with the belief that they can make a change. The CIVICUS CSI is pleased to announce the publication of the Analytical Country Report from Russia. The CSI was implemented in Russia by the Centre for Studies of Civil Society and the Non-Profit Sector (CSCSNS) of the National Research University Higher School of Economics (HSE) in Moscow. The significant economic, social and political changes of last 20 years have essentially transformed Russian civil society. Despite this, civil society had not still benefited from an adequate conceptual definition and description or a nuanced assessment of its status. 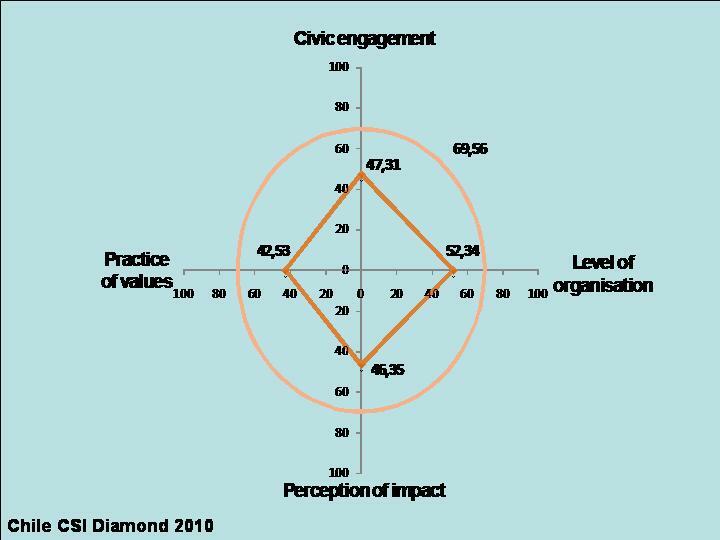 The diamond shows a relatively high score for the level of organisation of civil society. This proves that it is relatively institutionalised and stable, offering civil society a reasonable platform in which to do its work. However, the research also tells us that CSOs do not achieve a high degree of impact or significantly contribute to socio-political change in Russia, not least because of the lack of systematic interaction with authorities. This report therefore recommends that state authorities expand their interaction with CSOs and legislate to improve civil society’s environment. The research tells us that participation in civil society activities is not a typical behavioural practice for citizens of Russia. Civic participation in Russia is limited and there are low levels of trust in CSOs. Therefore strengthening this sphere is recommended, through the use of modern methods of encouraging participation, promoting civil society work more widely, and raising awareness of the best practices of CSO activity. Civil society in Russia is also found not to be a reliable conductor by which society’s issues reach the elite and elite decisions find a way to feedback to society. It is recommended that this problem be addressed by an expansion of civil society interaction with authorities. What is more, there is a necessity to promote and broaden the active work of CSOs and citizen participation by using modern methods of promoting participation, publicising civil society work and drawing attention to the best practices of CSO activity. Doing so will help to widen and broaden trust in CSOs. 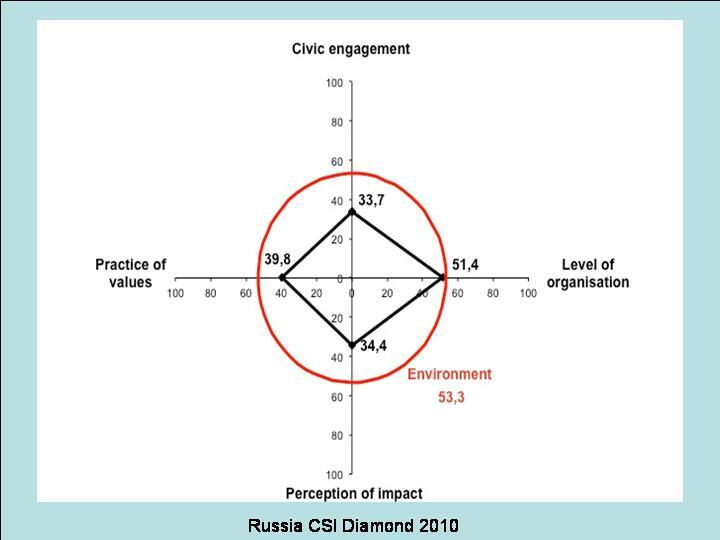 The CSI project has offered a complex assessment of the state of Russian civil society for international comparison. The draft of this report has already been used as material for the organisation of public and expert discussions on the state of civil society. The provision of objective information on this sphere of Russia should promote keen interest in and increased knowledge about recent developments in Russian civil society, both amongst civil society activists and other stakeholders domestically and internationally. The distribution of this report will, we hope, provoke discussion about and greater public attention to the state of Russian civil society and civic activity. The report finds that the modern concept of civil society in Japan was only introduced in recent years, despite its existence since early history. In 1998, the Law to Promote Specified Nonprofit Activities (NPO law), the first law to promote civic activities with minimum government intervention, was enacted, and this saw a burgeoning of the sector. With more than a decade now passed since the law, Japanese civil society sector finds itself at a crossroads, where decisions of civil society and government will determine whether it can become an influential sector to make society better or whether it will not be able to meet the growing expectations. 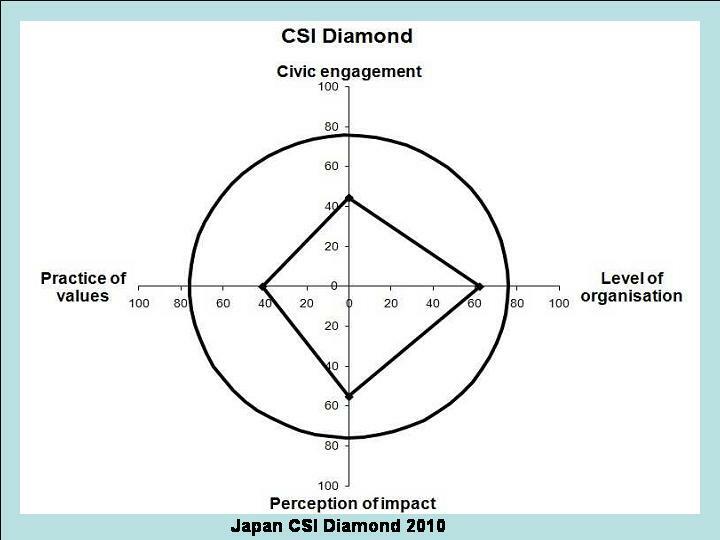 The comparison of scores for each dimension with other countries participating in the CSI project revealed that Japanese civil society has a high perceived impact, well established organisations and a favorable environment for civil society. On the other hand, as weaknesses, it is found that Japanese CSOs do not always perform well in practicing core values. The research raises concerns about poor working conditions for employees, and low awareness about environmental issues, while despite the higher score, the Level of Organisation dimension requires attention to organisations’ financial instability and the lack of sustainable human resources. Low levels of political engagement are also a cause for concern. Finally, although the External Environment dimension scored remarkably high, indicating that civil society has space to develop, there are concerns, such as low levels of public trust, that should influence the level of association. Additionally, this dimension pointed out missing important issues to be addressed, such as civic education and reform of the taxation system. The report, compiled before the recent tragic earthquake, overall paints a picture of a civil society that is committed, robust, and encouragingly ready to play its part in addressing the challenges that Japan now faces. CIVICUS is pleased to announce the publication of the Analytical Country Report on the state of civil society in Mexico. The CSI was implemented in Mexico by Centro Mexicano Para La Filantropía CEMEFI and Iniciativa Ciudadana para la Promoción de la Cultura del Diálogo. The report tells us that the complex development of civil society in Mexico has been marked by the political and social dynamics created by institutions as well as the unwritten rules of the party that governed for more than 70 years. Certain events have helped characterise the current state of Mexican civil society, such as the student movement of 1968, citizens’ efforts after the 1985 Mexico City earthquake and especially the movement surrounding the right to clean elections and multi-party democracy. This has enabled the consolidation of a sector that is diverse in its causes as well as in its internal dynamics and the mechanisms of its interaction with other actors. In the case of Mexico, there is greater realisation of the Practice of Values and a weaker presence of Civic Engagement. 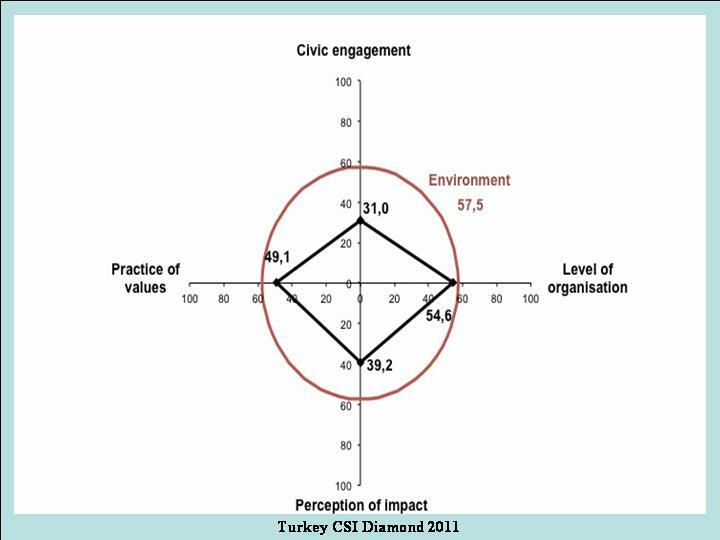 Meanwhile, the values for the Level of Organisation and Perception of Impact are very similar. The fifth dimension, the External Environment, is represented by a circle that surrounds the diamond. It shows a potential for growth in civil society in accordance with the current conditions of the country. Compared to previous decades Mexico has a better environment for enabling stable growth of civil society, although this is impeded by recent worsening conditions of personal insecurity, which will undoubtedly have a direct effect on the sector’s structure in the coming years. Taking into account the dimensions that make up the diamond, it is clear that in spite of some perceptions shared at focus groups, at the national level Mexican civil society has the possibility of strengthening. The Civic Engagement dimension indicated the need to build up social capital with knowledge and interest in social causes, but also proved that Mexican society engages at the grassroots in social concerns that promote its personal and spiritual development. As to the Level of Organisation, it can be seen that citizens are capable of generating actions in special cases to develop a solution to a pressing problem, and that for such purposes it is not always necessary to create a formal organisation. Practice of Values was the dimension recording the highest scores, however, the standardisation of CSO practices and the codes governing them should be considered. Finally, regarding Perceived Impact, in spite of the existence of successful cases related to CSOs achieving impact on policies, there is still a need to create new mechanisms of influence to enable organisations to impact the public sphere more. The CIVICUS Civil Society Index (CSI) is pleased to announce the publication of the 2010 Analytical Country Report from Turkey. The project was made possible by the collaborative efforts of CIVICUS and Third Sector Foundation of Turkey (TUSEV). A close look at the research findings shows civil society’s growing impact, expanding areas of activity and impressive initiatives to address some of Turkey’s most pressing social and political concerns. When compared to two decades ago, civil society’s arena and its organisations’ development have reached impressive heights. 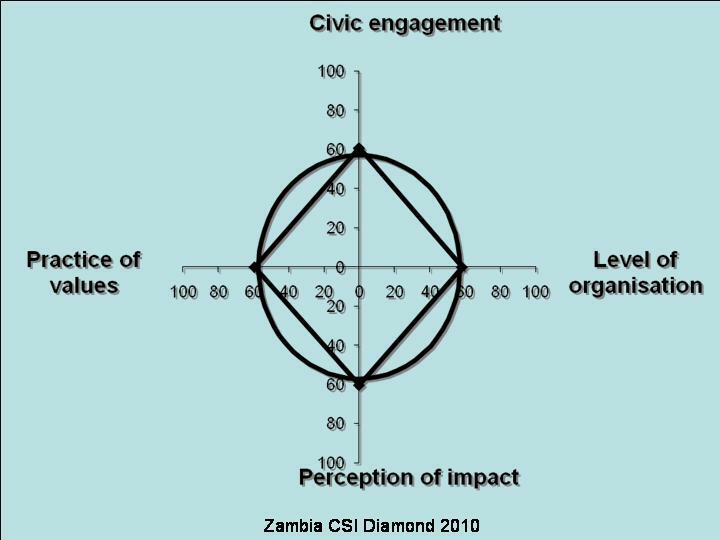 In this context, the previous CSI study (2006) pictured civil society in a conceptual and operational era of transition. Although research findings then showed more weaknesses than strengths, they also pointed towards some opportunities and potential for civil society actors to tackle the country’s democratisation and development goals. The current CSI study (2010) continues to show civil society in Turkey in an era of transition with more weaknesses than strengths. Although some of the opportunities that were pointed out in the first study have been addressed, the acceleration of civil society’s transition has decreased. The persistence of some major weaknesses is worrisome and points towards future obstacles. As such, the CSI study portrays civil society in Turkey facing a major turning point: it will either build on its strengths to deepen its role as an indispensable actor in social and political life in Turkey; or it will enter a period of stagnation that is bound by its persistent weaknesses. A comparative look at civil society’s strengths and weaknesses over time shows that there have been improvements in some areas while others have failed to progress. For instance, the socio-political and socio-economic environments, along with relations with the private sector, continue to offer strengths for civil society in Turkey. The increase in volunteering and membership rates in terms of participation, access to technology and support infrastructures, and a tendency not to associate civil society with negative values all show signs of improvement. However, the deep but narrow trends of participation, the minimal funding base of most CSOs and the significant regional differences within Turkey are all areas with need further attention. CIVICUS Civil Society Index (CSI) is pleased to the announce publication of the Analytical Country Report from Slovenia. The CSI was carried out in Slovenia by the Legal and Information Centre for NGOs, with the support of the Ministry of Public Administration. The main aim of the project was to promote and strengthen civil society through its assessment ad to develop recommendations and measures to improve it. 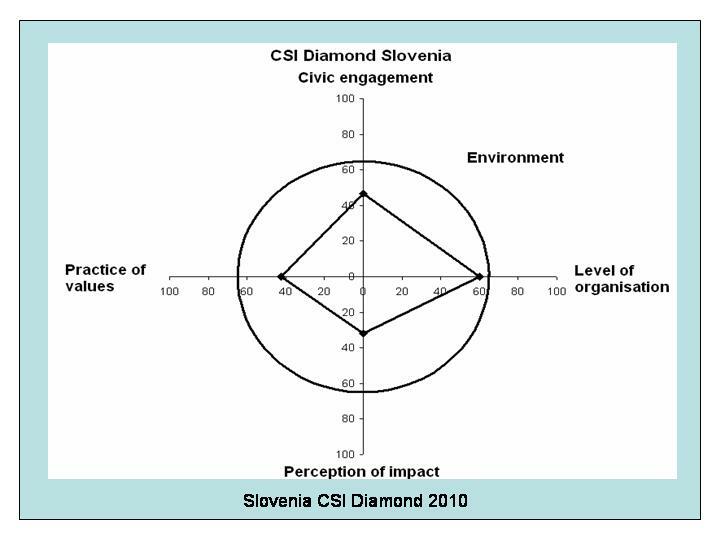 The Civil Society Diamond summarises the values of the quantitative indicators which represent the four basic dimensions of civil society, while the circle around it represents the fifth dimension, the external environment of civil society. The research findings show that Slovenian citizens readily engage as members of CSOs and as volunteers, and that volunteering in particular is on the rise, as a result of efforts made by voluntary organisations to establish a regulatory framework to provide support for the development and implementation of voluntary work at national and local levels. However, when it comes to participation in political activities, it is clear that while political parties wield the greatest influence, as a result of low trust in them, very few people participate in their activities. When CSOs practice of their own values is examined, the report affirms that CSOs generally adhere to regulations regarding democratic decision making governance, labour regulations, codes of conduct and transparency and environmental standards, although they could do more to promote their adherence to these values. The report also finds that while CSOs are relatively independent of the state, the lack of substantial government funding, the modest funds they acquire from other sources and the constant struggle for grants awarded through public tenders greatly reduces CSO autonomy. However, the analysis of the civil society sector in Slovenia shows that it has not yet reached a high level of development. Increasing the financial strength of CSOs and, consequently, their professionalisation, are the two key steps needed to develop the sector. In order to improve the state of the civil society sector, the government should both increase public financing of the sector, and also amend legislation to encourage funding from non-public sources, such as private donations from individuals and companies, thereby increasing the sector’s autonomy and independence. In order to facilitate the implementation of such changes, both the government and non-government sectors must reach a consensus on a clear-cut strategy for the development of the civil society sector. The report that concludes that the prerequisite for any of this to happen is to strengthen weak processes of civil dialogue in Slovenia. CIVICUS: World Alliance for Citizen Participation is pleased to announce the publication of the Civil Society Index (CSI) Venezuela Analytical Country Report. 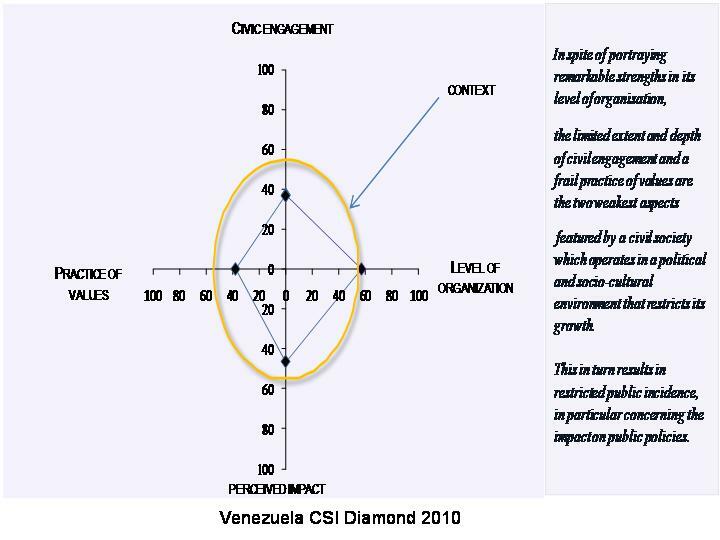 The CSI in Venezuela was implemented by SINERGIA, with local partnerships with the Development Efficiency Forum and the Association and NGOs Networks Articulation Board in Latin America and the Caribbean. Venezuelans, the report finds, have historically been inclined to perceive the state as responsible for the solution of all their needs, and therefore to give in to clientelism. This tradition has been exacerbated by recent trends towards state interventionism. The report suggests that three features distinguish Venezuelan civil society today: polarisation within a framework of political discrimination, fast transformations in response to a volatile environment and deep-rooted public anti-political attitudes. Venezuelan society, it concludes, is made up of two blocs: one in favour of the revolutionary project and one against. Between these two poles, most civil society organisations (CSOs) are affected by a model in which autonomous intermediate organisations are not considered by authorities as legitimate interlocutors. The report shows low civic participation and low impact of civil society on public policies and public attitudes. It also finds that the external context does not favour the development of civil society, with a significant number of CSOs forced to coexist within a restrictive legal framework and facing governmental practices that limit their autonomy. On the plus side, it finds that civil society has had a positive influence on the extension of social rights, and enjoys much stronger trust and public legitimacy compared to state agencies, the media and political parties. It concludes that this legitimacy offers a major opportunity for civil society’s development. Recommendations from the report suggest that the first priority is to create a dialogue platform to diffuse polarisation. This dialogue must include political parties and CSOs as well as the rest of civil society, and other sectors such as business, academia donors and sectors with different ideologies, both locally and nationally. Another priority is to recover interpersonal trust and civic spiritedness by enhancing the scope of values training programmes, and to fight against clientelism, upholding the right to participate in public spheres and to access state resources without relinquishing autonomy. Fostering civic engagement will, it suggests, involve organising a broad campaign informing of the rights granted by the Constitution, so as to arouse citizen consciousness about the need to join actively in their promotion. Venezuela, as one of the six countries from Latin America that implemented the CSI, has partnered with the other five countries to create a work team that will exchange the results of the project as a means for regional knowledge sharing.